Certified Documentary Credit Specialist (CDCS) Tutorial. CDCS is the international standard qualification for documentary credit specialists. It is a professional certification that enables documentary credit practitioners to demonstrate specialist knowledge and application of skills required for competent practice. CDCS was developed in partnership by the ifs School of Finance and the International Financial Services Association (IFSA). It is endorsed by the International Chamber of Commerce (ICC) and was developed in consultation with industry experts to ensure that the qualification reflects best practice. For more information on the CDCS tutorials kindly visit http://cdcstutorial.blogspot.com. Description: Zinc is also known as spelter, is a metallic chemical element; it has the symbol Zn and atomic number 30. It is the first element in group 12 of the periodic table. Zinc is, in some respects, chemically similar to magnesium, because its ion is of similar size and its only common oxidation state is +2. Zinc is the 24th most abundant element in the Earth's crust and has five stable isotopes. The most exploited zinc ore is sphalerite, a zinc sulfide. The largest exploitable deposits are found in Australia, Canada, and the United States. 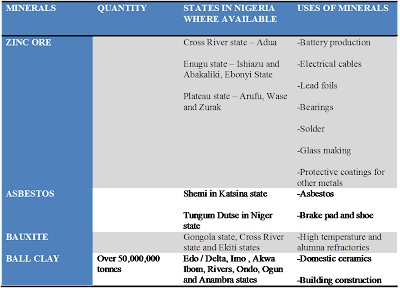 Zinc production includes froth flotation of the ore, roasting, and final extraction using electricity (electrowinning). Occurrence: The element is normally found in association with other base metals such as copper and lead in ores. Zinc is a chalcophile , meaning the element has a low affinity for oxides and prefers to bond with sulfides. Chalcophiles formed as the crust solidified under the reducing conditions of the early Earth's atmosphere. Sphalerite, which is a form of zinc sulfide, is the most heavily mined zinc-containing ore because its concentrate contains 60–62% zinc. 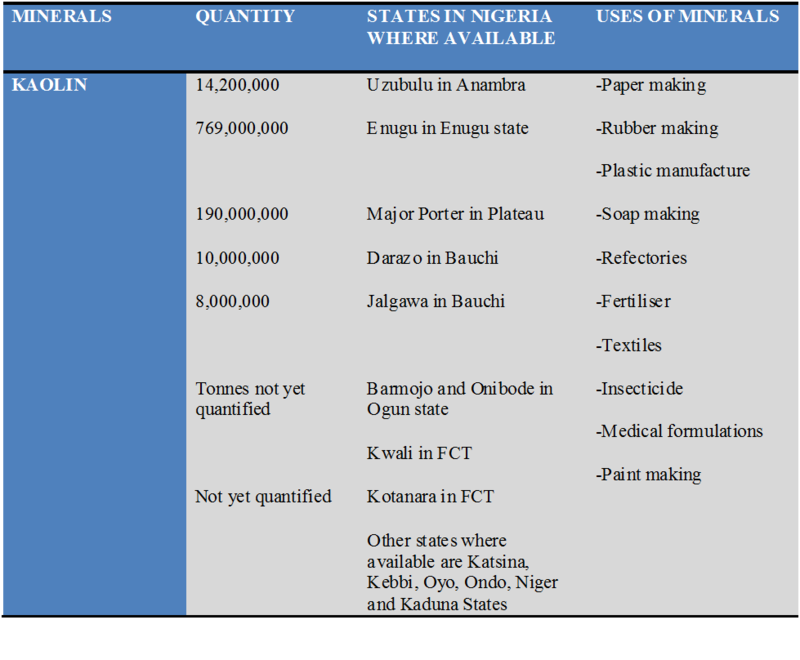 Locations: An estimated 10 million tonnes of lead/zinc veins are spread over eight states of Nigeria. Proven reserves in three prospects in the east-central area are 5 million tonnes. 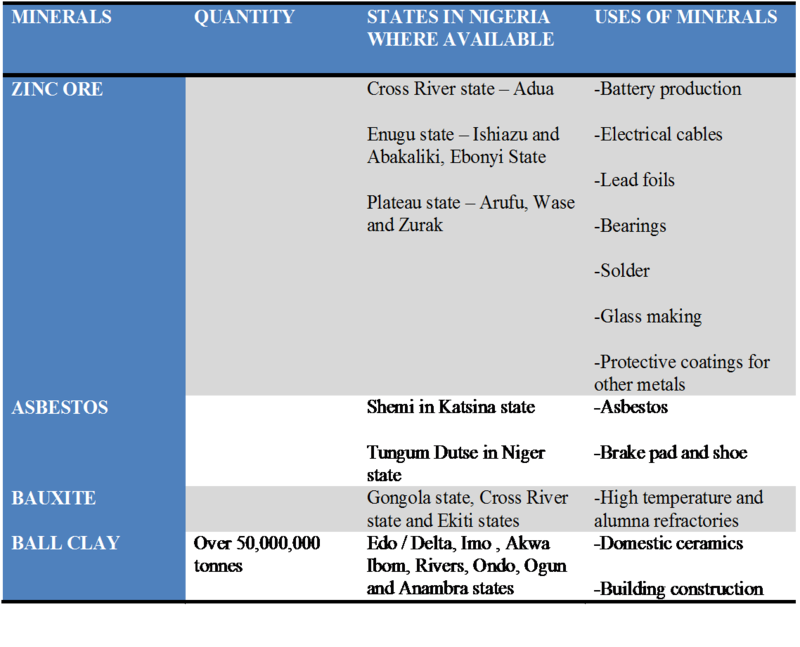 Lead/Zinc deposit kind be found in the follow states in Nigeria viz; Nasarawa, Taraba, Plateau, Abia, Ebonyi, Bauchi and Cross River and Enugu. Specifications: This varies from one buyer to the other. 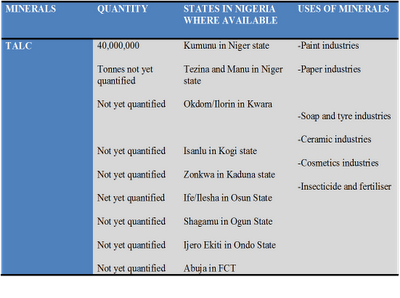 However generally most buyers will prefer the specifications stated in the table below. The lead content could vary from one buyer to the other, but generally for most importers, the other constituent should not be more than the stated percentage. Export market: The market for Zinc ore especially the overseas market in China is large, expanding and sustainable because of the numerous uses of ore. Buyers usually would like to secure steady source of supply of these products. 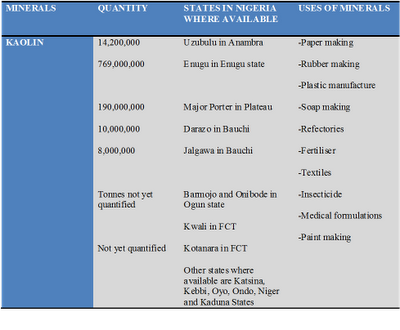 An exporter that is able to secure a contract at the right price would have an uphill task meeting the demand of the buyer because the output from the mines in Nigeria is low due to the use of crude implement. Other market includes India, Thailand and some European countries like Germany, Spain and Belgium. Export Price: Depending on the percentage purity of the Zinc ore and the prevailing London metal exchange (lme.com) price, the FOB price of Zinc ore could vary from US400-USD600/MT. Description: Lead is a main-group element with symbol Pb (Latin: plumbum) and atomic number 82.it is a soft, malleable poor metal. It is also counted as one of the heavy metals. 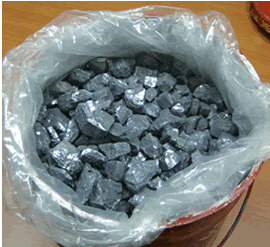 Metallic lead has a bluish-white color after being freshly cut, but it soon tarnishes to a dull grayish color when exposed to air. Lead has a shiny chrome-silver luster when it is melted into a liquid. Occurrence: Metallic lead does occur in nature, but it is rare. Lead is usually found in ore with zinc, silver and (most abundantly) copper, and is extracted together with these metals. The main lead mineral is galena (PbS), which contains 86.6% lead. Other common varieties are cerussite (PbCO3) and anglesite (PbSO4). Locations: Lead-Zinc occurrences in Nigeria are associated with saline water intrusion in the sedimentary basins or fractured / shear zones in crystalline rocks. The mineralisation is often associated with minor to significant amounts of copper and silver, occurring in lodes filing the fractures within the sedimentary rocks in the Benue Trough as well as in crystalline basement rocks as shown in recent studies by Nigerian Geological Survey Agency. 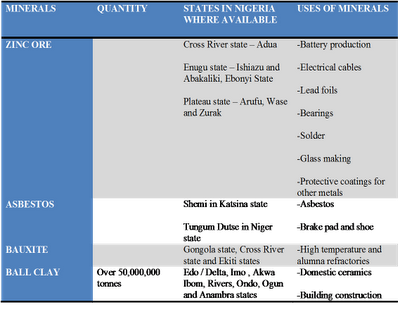 Precisely, Lead/Zinc deposit kind be found in the follow states in Nigeria viz; Nasarawa, Taraba, Plateau, Abia, Ebonyi, Bauchi and Abuja. The general geology of lower Benue Trough in Abakaliki area is made up of thick sequences (500m) of slightly deformed cretaceous sedimentary rocks made up of essentially of albian shales, subordinate siltstones of the Asu River Group. There is also the presence of Volcanic and Pyroclastic materials forming elongated conical hills in the cores of the anticlinal Structures. 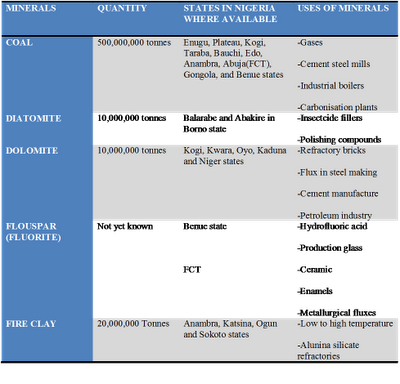 The Abakaliki Lead-Zinc is believed to be of hydrothermal origin emplaced at a low temperature of about 140°C and it is made up of primarily four lodes namely Ishiagu, Enyigba, Ameri and Ameka in the lower Benue Trough located in Ebonyi State. Alloys and as a radiation shield. Lead has the highest atomic number of all of the stable elements. Lead is a major constituent of Lead- Acid battery. Lead is used as a colouring element in ceramic glazes, notably in the colors red and yellow. 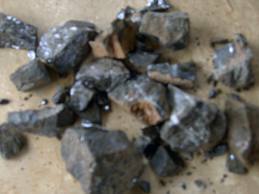 Lead is used as projectiles for firearms and fishing sinkers because of its density. Low cost compared to alternative products and ease of use due to relatively low melting point. Lead is also used in high voltage power cables as sheathing material to prevent water diffusion into insulation. 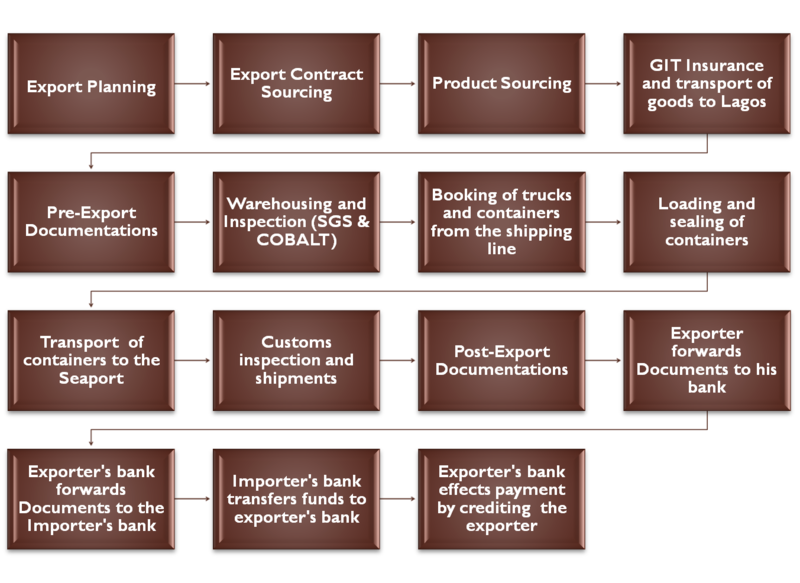 Export market: The market for lead ore especially the overseas market in China is large, expanding and sustainable because of the numerous uses of ore. Buyers usually would like to secure steady source of supply of these products. 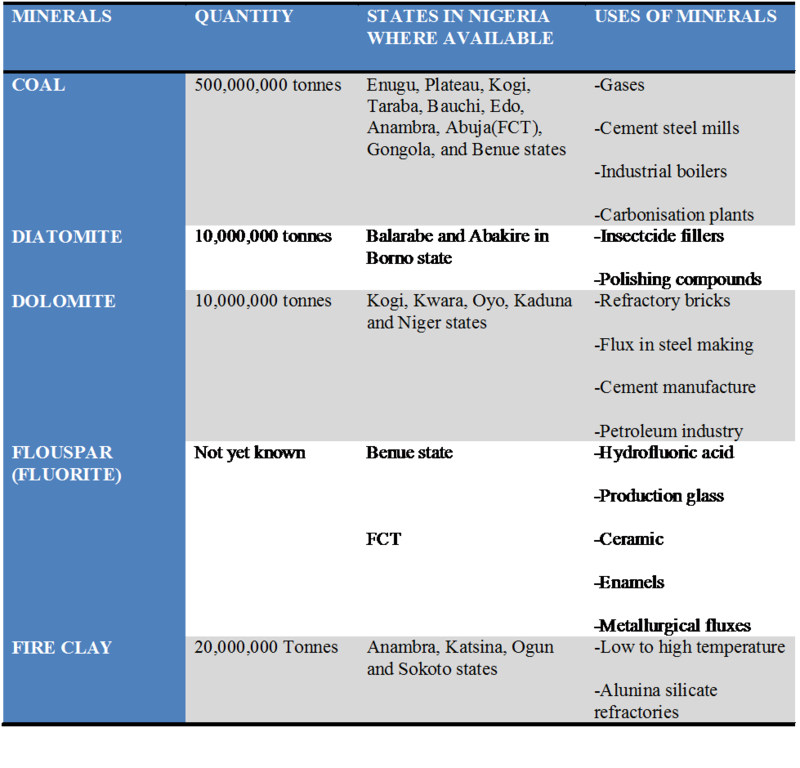 An exporter that is able to secure a contract at the right price would have an uphill task meeting the demand of the buyer because the output from the mines in Nigeria is low due to the use of crude implement. Other market includes India and some European countries like Germany, Spain and Belgium. Export Price: Depending on the percentage purity of the lead ore and the prevailing London metal exchange (lme.com) price, the FOB price of lead ore could vary from USD600-USD900/MT. Description: Cocoa bean (also cacao bean, often simply cocoa and cacao) is the dried and fully fermented fatty seed of Theobroma cacao, from which cocoa solids and cocoa butter are extracted. A cocoa pod (fruit) has a rough leathery rind about 3 cm thick (this varies with the origin and variety of pod). It is filled with sweet, mucilaginous pulp (called 'baba de cacao' in South America) enclosing 30 to 50 large seeds that are fairly soft and pale pink or lavender in color. Seeds usually are white, becoming violet or reddish brown during the drying process. The exception is rare varieties of white cacao, in which the seeds remain white. Historically, white cacao was cultivated by the Rama people of Nicaragua. It provides means of livelihood, sustenance and employment opportunities to over five million Nigerians, In the year 2005 alone, export revenue from the sale of cocoa amounted to US$136.7 million. Nigeria along with Cote d'lvoire and Ghana all in West Africa, account for about 70% of the world's cocoa production. World Producers: The four major West African cocoa producers are the Ivory Coast, Ghana, Nigeria and Cameroon. The Ivory Coast produces about 43 percent of the world's cocoa. The next largest producer is Ghana with about 14 percent of the world's output. Nigeria produces about 6 percent of the world's cocoa. Outside of West Africa, the major producers of cocoa are Indonesia, Brazil, Malaysia, Ecuador, and the Dominican Republic. 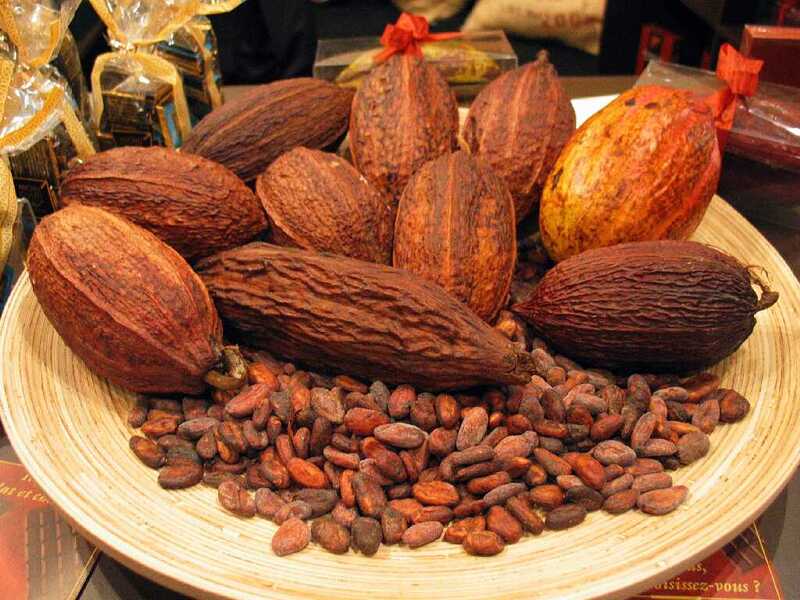 Cocoa producers like Ghana and Indonesia have been making efforts to increase cocoa production while producers like Malaysia have been switching to other crops. Harvest: Cocoa trees reach maturity in 5-6 years but can live to be 50 years or more. During the course of a growing season, the cocoa tree will produce thousands of flowers but only a few will develop into cocoa pods. The typical production pattern is for a large main crop to be followed by a smaller mid crop. In West Africa, the main crop harvest starts in the September-October period and can extend into the January-March period. That is followed by the smaller mid crop harvest which is usually of lower quality than the main crop. Locations: Cocoa beans is produced in 16 states of the federation namely Ondo, Cross River, Oyo, Osun, Ekiti, Ogun, Edo, Kogi, Akwa Ibom, Delta, Abia, Kwara, Ebonyi, Rivers, Taraba and Adamawa with an annual production of 400,000 metric tonnes however 98% of this is exported. OndoState is the highest cocoa producing State in Nigeria and Idanre is the hub of cocoa Production in the state. Uses: Cocoa seeds are the source of commercial cocoa (cocoa beans), the four intermediate cocoa products (cocoa liquor, cocoa butter, cocoa cake and cocoa powder) and chocolate. 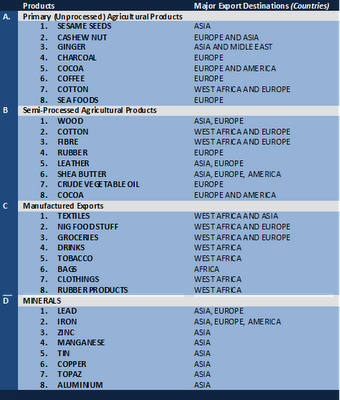 Although the market for chocolate is the largest consumer of cocoa in terms of bean equivalent, intermediate products such as cocoa powder and cocoa butter are used in several areas. Cocoa powder is essentially used as flavor in biscuits, ice cream, dairy drinks and cakes. Apart its use as flavor it is also used in the manufacture of coatings for confectioners or frozen desserts. Cocoa powder is also consumed by the beverage industry for example for the preparation of chocolate milk. Besides the traditional uses in chocolate manufacture and confectionery, cocoa butter is also used in the manufacture of tobacco, soap and cosmetics. It is also a folk remedy for burns, cough, dry lips, fever, malaria, rheumatism, snakebite and wounds. It is reported to be antiseptic and diuretic. 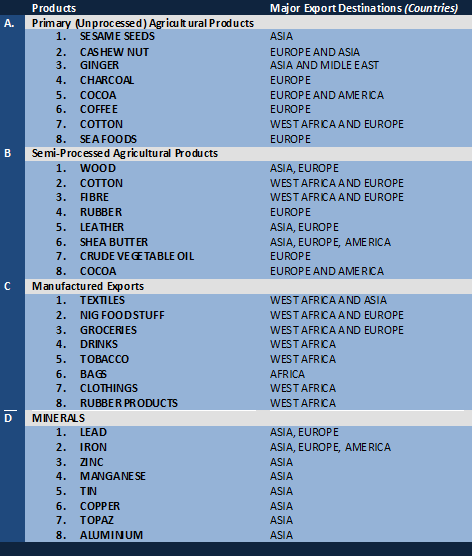 Export market: Major market destinations for Nigeria's Cocoa are: Netherlands, U.K., France, Germany, Spain, Italy, USA and Japan. Other markets being explored are the emerging economic powers of China and India. Export Price: The export free on board price of cocoa beans has fluctuated between USD3,000-3,500/MT from January to August 2010. 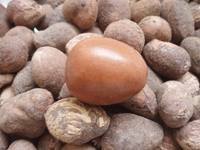 Local price: The local market price of raw cocoa beans per MT ranges from NGN400,000.00 to NGN500,00.00 to deliver it to Lagos during the season and also when the commodity is off the season.